After the Dinomation Museum, we had lunch at McDonald's Playplace, right across Jurassic Court. Next, we headed south about one mile on Hwy 340 to Dinosaur Hill, on the left of the road. We were greeted with a sign announcing that crews were repairing the pathways and that it might be closed to visitors. However, the parking lot was deserted. There were some signs of construction - piles of fine gravel and other construction materials. We got out of the car and proceeded to follow the trail, using the Dinosaur Hill Trailmap (217 KB). The trail map file is in Adobe Acrobat .pdf format and can be printed. 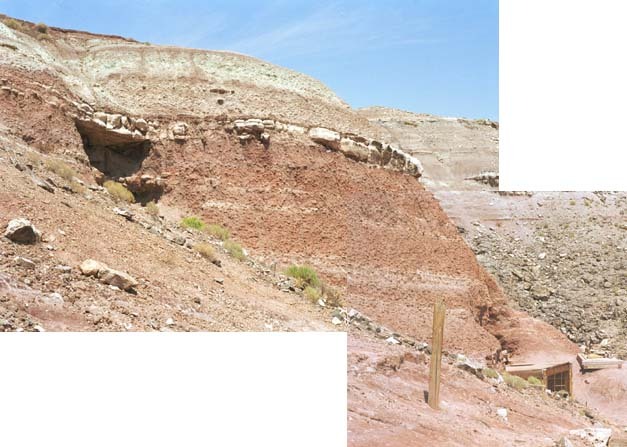 First we saw a cast of a sauropod femur about 10 feet above the path in a boulder. We then continued up the hill for what seemed an interminable time. It was made much worse by the 95 degree heat at 12:30 PM. Finally we made it to the top to a rest shelter. We shared most of a bottle of water and tried to cool off. This is the view we saw from just in front of the shelter at the top of Dinosaur Hill. Use the horizontal scroll bar at the bottom of your browser window to view the entire 360 degree panorama. The path from here on was confusing. We tried going down to the north but the path that way seemed to peter out. We tried a couple of paths across the top of the hill to the west but they too disappeared. We finally used the path to the north even though it went quite a ways down (we didn't really relish walking up any more in the heat). Winding and twisting its way around the hill past some heaps of debris, the path finally came to this monument with a sign describing the dinosaur mine behind. We could really sympathize with Elmer Riggs and his crew in 1901 with the heat that day. 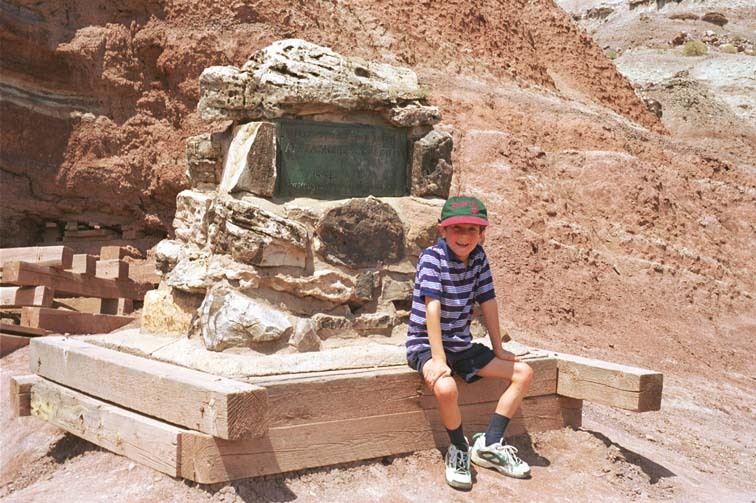 We saw a replica of his tent back at the Dinomation Museum and saw photos of his campsite which was right here. 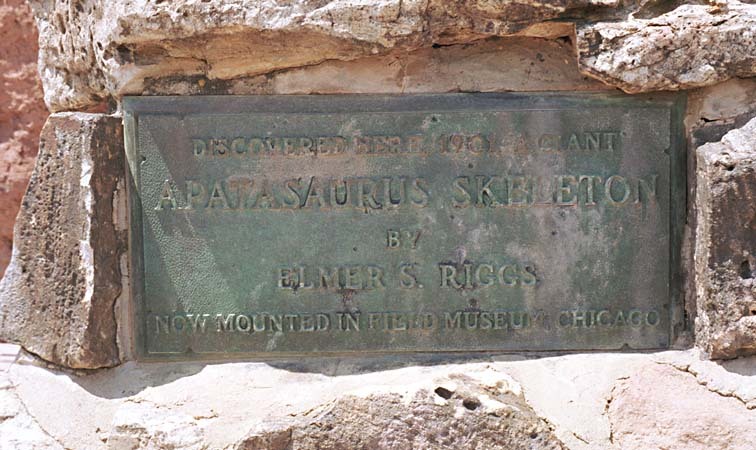 This is a detail of the sign describing the Apatasaurus mine. Of course, in 1901 when it was discovered, this specimen was called a Brontosaurus. We walked further along the path and looked back to this view of the Apatasaurus mine, below the cliff to the right.